Meets 5/21/2010 – 6/25/2010 on Tuesday, Wednesday, & Friday from 12:00 PM to 4:45 PM. Sustainability is an all-encompassing topic with pragmatic, conceptual, and aesthetic implications to both society and the environment. 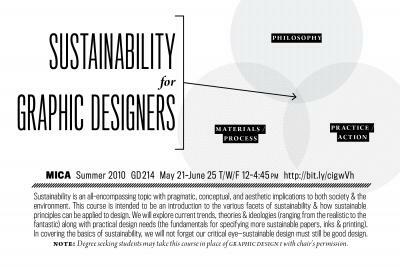 This course is intended to be an introduction to the various facets of sustainability and how sustainable principles can be applied to design. We will explore current trends, theories and ideologies (ranging from the realistic to the fantastic) along with practical design needs (the fundamentals for specifying more sustainable papers, inks and printing). In covering the basics of sustainability, we will not forget our critical, artistic eye—sustainable design must still be good design. note: Degree seeking students may take this course in place of Graphic Design I with chair's permission.